» Your place to relax and have fun in Sun Prairie! At Pitstop we offer daily Lunch Specials (M-F). Please feel free to call us at 608-825-9977 and check the special of the day!!! Call ahead dine-in/carry out orders are always welcome! The public parking lot off Co. Rd N/HWY 19 is available for customers to park. We also offer free Cab rides when you're ready to go, thanks to SAFE RIDE. The food here is delicious and will keep you coming back for more! We have Daily Lunch Specials that are posted everyday on our Facebook page! 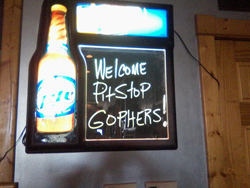 Stop by and join us for Lunch, we'd be happy to have you join us at the Pitstop Pub!